Trainer Gary Portelli wouldn’t say no to a surprise Everest berth but he’s just hoping stable star She Will Reign can take her connections on one final ride this spring. The now four-year-old’s rags to riches story has captivated racegoers and gained mainstream coverage since her fairytale Golden Slipper win in 2017 and the last chapter begins in the Group 2 $200,000 Mostyn Copper Group Missile Stakes (1200m) at Royal Randwick on Saturday. 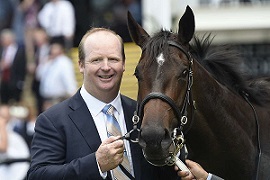 Trainer Gary Portelli and She Will Reign. (Pic: Bradley Photos). She Will Reign was sold to overseas interests during her spell but she races for Portelli and the current owners through this campaign so the trainer says the pressure is off. “She’s got nothing to prove, we’re just going to go out there to enjoy what we have left of her,’’ Portelli said. “There’s no pressure on us, she’s got two Group 1s so her value can’t change. We’re going to the races without that heavy feeling you have of expectations. ‘Daisy’, as the mare is affectionately known, was purchased for just $20,000 and to date has banked just over $3.2 million. She was among the first secured for the inaugural running of The Everest and went into the race one of the leading chances on the back of a first-up Group 1 weight-for-age win in Melbourne but beat one home and pulled up with excuses. Another crack at The Everest would be a dream finale for the She Will Reign camp but Portelli is realistic. The mare was on the fourth line of Missile betting at $9 with TAB on Thursday behind Kementari ($1.95) who is third favourite for The Everest despite not having a slot. “I’m not saying we’d turn our back on it if we got the call up,’’ Portelli said. “Whoever has a slot, if they are to take one out of this race they’ll want to look impressive. You’d want to see a real dominant performance. Portelli has said a number of times that She Will Reign has changed shape since her two-year-old days and suspects she could be racing more like a 1400m-mile horse. The feedback from trial jockey James McDonald (Kerrin McEvoy rides on Saturday) somewhat confirmed the trainer’s thoughts on that matter. “I was only watching on the phone but I asked James if he clicked her up because it looked like he was riding her along at one point,’’ Portelli said. “He said he was just going with her, she’s so relaxed and unless you ask her to go she’ll stay there. That’s what she’s doing at trackwork and she’s turned into a horse that might get further. While barrier one isn’t a gate Portelli would have chosen for She Will Reign, he’s rapt with stablemate Nicci’s Gold jumping from two in the Everest Carnival On Sale Handicap (1800m). A noted backmarker over shorter trips, Nicci’s Gold steps out in distance for the first time on Saturday and Portelli would like to see her make use of the good draw so she doesn’t have to give away an impossible start. Punters Intel shows the mare easily ran the fastest last 600m of her 1400m race at Randwick two weeks ago in 33.86, running 11 seconds from the 400m-200m and 11.50 home after being over 29m off the lead at the 800m. “We’ve stepped her up in distance and at 1800m around Randwick you’d have to think the tempo will be a lot slower than what she’s been tracing in lately,’’ Portelli said. Meanwhile, promising three-year-old Dio D’Oro is a couple of weeks off trialling ahead of a return in the Group 3 San Domenico Stakes (1100m) on August 25.